The Collecta today is at the Church of St. Angelius “in piscibus.” The gathering of the faithful today was near the fish market; the church was in existence before the Eighth Century. The seven martyred sons of St. Symphorosa repose here. The Station is at St. Nicholas in Carcere Over sixty churches were dedicated to St. Nicholas: this one stands near the ancient site of a public prison, and is built on the ruins of a pagan temple of Piety. This Saturday is called sitientes from the opening words of the Introit. Since the time of Pope Gelasius it has been a day for conferring Holy Orders, and was therefore once a day of great fast, extending through the night. In the Epistle the prophet Isaias sees hastening from all sides the Christian people who are waiting with holy impatience for the Easter Feast, when at last their souls may quench their thirst in the springs of grace through the Sacraments of Baptism and Penance. The Gospel teaches us that if the house of God on earth is not to be turned into a house of traffickers – still less can we purchase our entrance into Heaven. We are to drink with joy from the fountains of grace which flow from the blessed Eucharist. To those who are in darkness Jesus gives light, for He is “the light of the world, and he who followeth Him walketh not in darkness, but in the light of life.” Let us also ask Christ to fill our minds and our hearts with the light of His grace. All you who thirst, come to the waters, says the Lord: and you who have no money, come and drink with joy. Ps 77:1 Hearken, My people, to My teaching; incline your ears to the words of My mouth. V. Glory be to the Father, and to the Son, and to the Holy Ghost. R. As it was in the beginning, is now, and ever shall be, world without end. Amen. All you who thirst, come to the waters, says the Lord: and you who have no money, come and drink with joy. Make fruitful, we beseech You, O Lord, the zeal of our fervent devotion; for only if it pleases You shall the fasting we have undertaken be of benefit to us. Through Jesus Christ our Lord, Who liveth and reigneth with Thee in the unity of the Holy Ghost, one God Forever and ever. R.Amen. Lesson from Isaias the Prophet. Thus saith the Lord, In an acceptable time I have heard thee, and in the day of salvation I have helped thee: and I have preserved thee, and given thee to be a covenant of the people that thou mightest raise up the earth, and possess the inheritances that were destroyed; that thou mightest say to them that are bound. Come forth; and to them that are in darkness, Show yourselves. They shall feed in the ways, and their pastures shall be in every plain. They shall not hunger, nor thirst, neither shall the heat nor the sun strike them; for He that is merciful to them shall be their shepherd, and at the fountains of waters He shall give them drink. And I will make all My mountains a way, and My paths shall be exalted. Behold these shall come from afar, and behold these from the north and from the sea, and these from the south country. Give praise, O ye heavens, and rejoice, O earth; ye mountains give praise with jubilation: because the Lord hath comforted His people, and will have mercy on His poor ones. And Sion said, The Lord hath forsaken me, and the Lord hath forgotten me. Can a woman forget her infant, so as not to have pity on the son of her womb? and if she should forget, yet will not I forget thee: saith the Lord almighty. On You, O Lord, the unfortunate man depends; of the fatherless You are the helper. V. Why, O Lord, do You stand aloof? Why hide in times of distress? While the wicked man is proud, the afflicted is set on fire. At that time, Jesus spoke to the multitudes of the Jews, saying, “I am the light of the world: he that followeth Me, walketh not in darkness, but shall have the light of life.” The pharisees therefore said to Him, Thou givest testimony of Thyself; Thy testimony is not true. Jesus answered and said to them. “Although I give testimony of Myself, My testimony is true, for I know whence I come, and whither I go; but you know not whence I come, or whither I go. You judge according to the flesh: I judge not any man. And if I do judge, My judgment is true; because I am not alone, but I and the Father that sent Me. And in your law it is written, that the testimony of two men is true. I am one that giveth testimony of Myself; and the Father that sent Me giveth testimony of Me.” They said therefore to Him, Where is Thy Father? 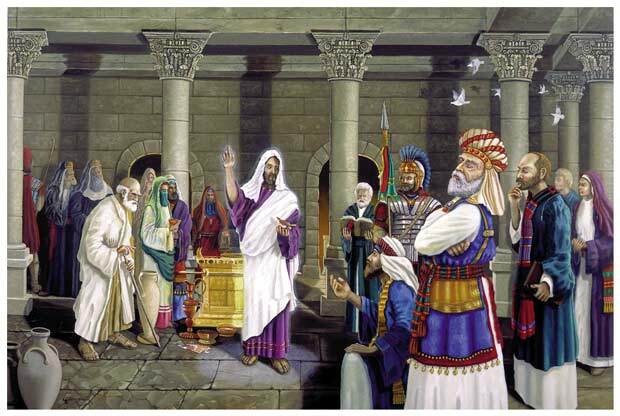 Jesus answered, “Neither Me do you know, nor My Father: if you did know Me, perhaps you would know My Father also.” These words Jesus spoke in the treasury, teaching in the temple: and no man laid hands on Him; because His hour was not yet come. The Lord is become my rock, my fortress, my deliverer; and in Him will I put my trust. Graciously accept our offerings, O Lord, we beseech You, and mercifully direct our still rebellious wills to You. Through our Lord Jesus Christ Thy Son. Who liveth and reigneth with Thee in the unity of the Holy Ghost, one God Forever and ever. R.Amen. The Lord is my Shepherd; I shall not want. In verdant pastures He gives me repose; beside restful waters He leads me. May Your holy sacrament cleanse us, we beseech You, O Lord, and may its power make us pleasing to You. Through our Lord Jesus Christ, Who livest and reignest, with God the Father, in the unity of the Holy Ghost, one God For ever and ever. R. Amen. O God, Who would rather show mercy than anger toward those who hope in you, make us truly sorry for the evil we have done, that we may be worthy of your merciful consolation. Through Jesus Christ, thy Son our Lord, Who liveth and reigneth with thee, in the unity of the Holy Ghost, ever one God, world without end. R. Amen. AbrahamAmen.Gloria PatriGodHolySpiritin nómine tuo"IntroitJerusalemJesuLazarusLordmaryO LordPhariseesSaturday Lent IV: Missa "Sitiéntes"